Seventh Generation needs your help making our nation’s outdated chemical law tougher, in order to make the world safer for our children. Join us in spreading the word about the Million Baby Crawl (http://www.millionbabycrawl.com/) to help educate and empower parents to raise their voices for stronger standards on toxic chemicals. In the 33 years since Congress passed that nation’s chemical regulatory law, the Toxic Substances Control Act (TCSA), the Environmental Protection Agency has required testing on just 200 of the more than 80,000 chemical compounds developed for products used in the home. Under the current law, the EPA does not have the authority to demand the information it needs to evaluate a chemical’s risk, and neither manufacturers nor the EPA are required to prove a chemical’s safety as a condition of use. Studies show that nearly 200 industrial chemicals and pollutants have been found in the umbilical cord blood of newborns (EWG). 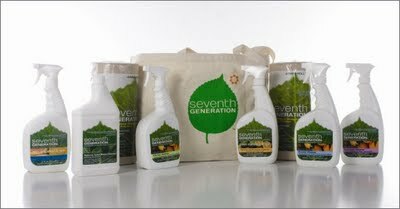 …and a Seventh Generation Tote to haul all your new stuff! 1) what the name of your crawler is and 2) one fact about this issue that you found to be compelling. That’s it! This contest will be open until Monday, November 16 at 0730 hours, EST. Please leave your email address and a separate comment for EACH entry into this contest. My crawler's name is Sara and I found this issue to be compelling because I never knew that this was such a huge issue until I went to the Seventh Generation website. With little one's here at home, this is definitely something that I will continue to support until someone in Washington listens and takes a stand. Thanks so much for such a wonderful giveaway! Oops, I originally put it on the wrong page! I made a little crawler, his name is Tate!! I found it very shocking that they have found 200 chemicals in the umbilical cord blood, this are supposed to be the time that we are protecting our babies!! I created my Crawler…His name is Praise. The fact that they test on just 200 of the more than 80,000 chemical compounds developed for products used in the home is horrific.